Cannon County sophomore shortstop Austin Brown gets the out at second and looks to complete the double play in a recent game. Brown and the Lions will play in the District 8-AA Tournament Thursday. Cannon County’s baseball team dropped a pair of non-district games last week, falling to Eagleville, 7-3, and Middle Tennessee Christian, 7-3. The Lions played last week with some of their seniors who were on “Senior Trip” with CCHS. The team, which was competing in the Grundy County Tournament during the weekend, has completed the District 8-AA portion of its schedule. The Lions fell behind Eagleville, 5-0, after two innings and were never able to recover. No player had a multi-hit game, but eight different Lions did pound out a base knock. Austin Brown, Cody Phillips, Chase Gunter, Brent Duggin, Brock Francis, Dustin Mears and Nathan McGuire all had hits for the Lions. Mears was 1-for-4 with a run scored. Francis (1-for-2) and McGuire (1-for-2) were responsible for Cannon County’s RBI. Early-inning woes once again were a problem for the Lions against MTCS. Cannon County went on top 1-0 in the top of the first but the Cougars answered with four in the bottom of the inning and tacked on three more in the second to go on top 7-1. The Lions, who were led by Austin Brown’s 3-for-3 performance, pulled to within 7-3 with two in the top of the third before the Cougars ended the comeback bid with seven in the fourth. Brown was 3-for-3 with a double and two runs scored. Trent Fagan was 2-for-3 with two RBI and Austin Parker was 2-for-3 with one RBI to pace the Cannon County offensive attack. 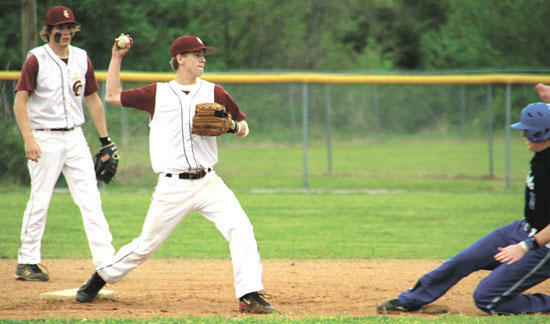 Cannon County dropped to 6-12 with the two setbacks; however, the Lions have played much better down the stretch and have secured a first-round home game in the District 8-AA Tournament Thursday (May 5). The Lions will host Livingston Academy.